FUNK/SOUL, Motown, USA, 1981... 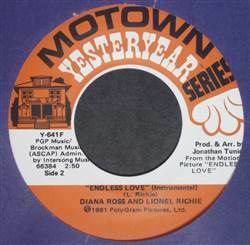 Endless Love (Vocal), Endless Love (Instrumental). Solomon Burke / Esther Phillips - Just Out Of Reach (Of My Two Open Arms) / Release Me 45 Freddie Jackson - Tasty Love / I Wanna Say I Love You 45 Hollywood Flames - Chains Of Love / Let's Talk It Over 45 Octavia - 2 The Limit 12"